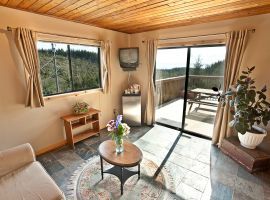 Named after the hiking trail between Jordan River and Botanical Beach, this large newly renovated suite has two rooms: a cozy bedroom with a Queen size bed, and a den with a pull out couch (Double), a lounging chair, coffee table and TV with satellite. 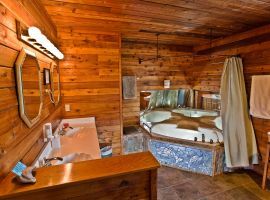 The bathroom is one of a kind, with stunning cedar walls and ceiling, a two person soaker tub, mosaic tile and natural stone. There are sliding glass doors leading out to a deck from the den, with beautiful views of the Pacific Ocean and Olympic Peninsula. 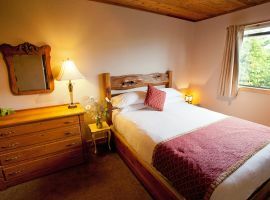 This is an ideal suite for those seeking a bit more space, or for couples traveling together. Comfortably sleeps 2 to 4 people. Stairs are used to access this unit. Rates - $150 to $200 with Full Hot Breakfast. Click BOOK ONLINE for rates on specific dates.